It's only 591 characters. We strongly recommend writing at least 1.000 characters. Use content that makes your app unique (features description, characteristics, how to use your app, ...). Your description needs to convince people to download your app. Also, be sure to add important and relevant keywords in your description to improve your iTunes app page and optimize your SEO. Your app's last version was released on November 20, 2013. It is important to regularly update your app. Best practices recommend to update your app every 4 to 6 weeks. This means fixing reported bugs, improving existing features, launching new features etc. Keep an eye on users' feedback. The next great features may already be asked by many users. Finally your wait is over!!! Tribal Battles is here available on the iOS Platform. 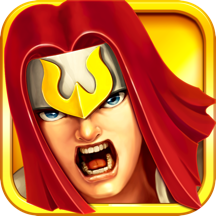 Now come and join us to wage epic battles against rival tribes and defend your own. Build, Fight and Defend! Build, Fight and Defend! You can make your tribe to be the strongest among them all! Tribal Battles is one of the best strategy games on the mobile platform. You can organize different types of troops and apply sophisticated strategies to attack your enemies no matter how devious your enemies are. Become a brilliant commander as you always dream of! And the best part is that it is FREE to play!